No PP except for a bit of a crop and light adjustment. Would you believe this was my first trip there? Thanks to my friend Sharookh for taking me there. It's a BUSY place and so colorful you don't know what NOT to shoot! This was evening time when people are busy preparing to sail next day. Morning is when they return with the catch and is another sight all together. Am feeling better and have resumed work but may take a couple of days to be 100% fit. Thanks you all for your concern & wishes. The Sassoon Docks is one of the few docks open to the public in Mumbai, India. It was built by David Sassoon, a Baghdadi Jew. 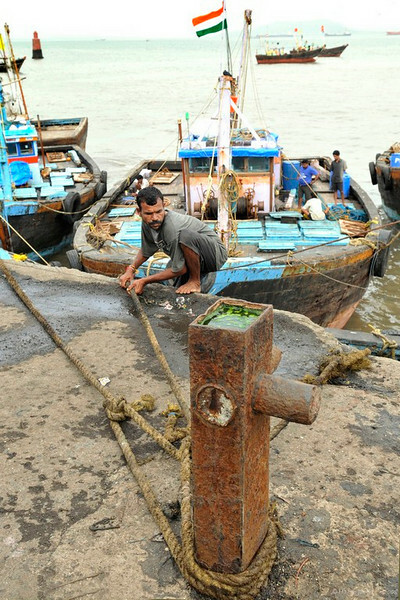 The docks is the main fish loading and trading centre in South Mumbai. A very clean well balanced snap. This is REAL life for alot of folks, and survival for most. Thanks for the reflection of part of humanity. I would love to be there !! super perspective on this; glad you're feeling better. Wonderful capture. Hope you're feeling better. That's what I get when I'm not around for a while, miss out on several things, like today I'm finding out that you've not been well. Glad to read that things are going your way! Boy, I like both versions. It would be tough to decide between the two. Both are very nice!